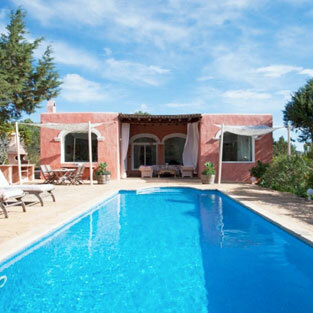 In the prestigious beautiful cala of Es Torrent, surrounded by the nature, up a beautiful cliff, La Mimosa is a private house, exclusive for who aim to enjoy relaxing time in the middle of the plants and mountains. Walk distance to the Es Torrent Cala, next to Cala Porroig are a unique beauty down the coast between Cala Jondal and the Es Cubells area. Here the scenery is charming and recondite, ideal for whom loves tranquillity and privacy. In the Es Torrent Cala there are nearly not houses only a few, so it is very special to have a property into this exclusive landscape. Modern, romantic, practical, you can enjoy nice breakfasts and dinners on the beautiful outdoor and chill-out areas. The master bedroom with en-suite bathroom is very spacious and from the large windows it is possible to view the swimming pool surrounded by plants and threes. General: air-conditioning, internet access, parking outside in común área. Direct Access to the sea. Bathrooms: 2 Bathrooms en suite for both bedrooms with toilet & shower. Bedrooms: 2 Bedrooms with queen size doublé beds, Sleeps 4.